As usual, I like to throw in something cool for the kids. These are great ideas for birthday party treats. Slice the mini watermelon in half. Remove the watermelon from the inside. You donât have to throw away the watermelon. Enjoy it as usual. Using paper towels, dry off the inside of each watermelon half. Prepare the two boxes of Jello, mixing according to the directions on the box in a large mixing bowl. Pour the bowl of prepared Jello mixture into the hollowed out watermelon halves. Put the jello filled watermelon halves in the refrigerator. Place some paper towels underneath them, just in case they spill. Let the watermelon sit in the refrigerator for 6 hours, or until it is completely firm. Remove the watermelon and slice it into pieces! NOTE: slice thick pieces! If the slices are too thin, the jello wonât stand up tall (it will flop over). Boil one cup of water. 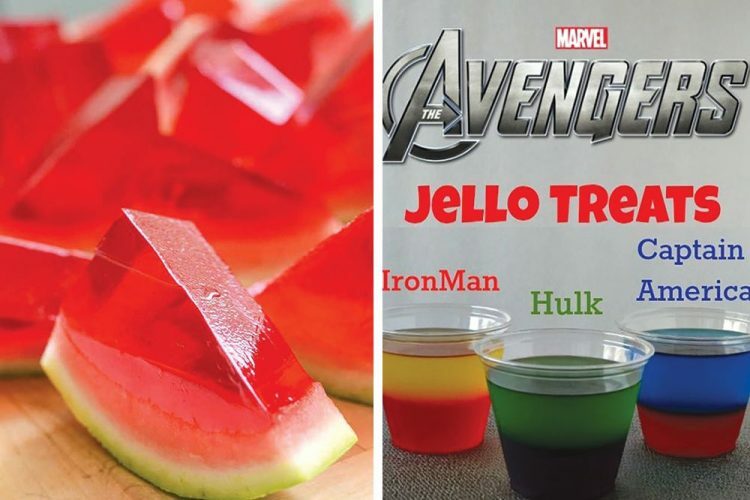 Add first Jello box (Grape for Hulk, Strawberry for Iron Man and Captain America). Stir for 2 minutes until Jello is completely dissolved. Stir in 1 cup of cold water. Pour evenly into 4 cups per super hero (If you are doing all three, youâll pour in 12 cups). Set up in fridge for 3-4 hours. Repeat for second Jello layer (Lime for Hulk, Pineapple for Iron Man, Blue Raspberry for Captain America). Stir for 2 minutes until Jello is completely dissolved. Stir in 1 cup of cold water. Make sure liquid is cold to the touch. Pour over first Jello in cups. Let set up in fridge for an additional 3-4 hours. Then enjoy.